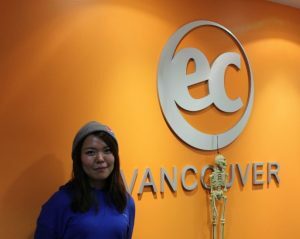 My name is Hana Inoue from Japan and I want to talk a little bit about my experience studying at EC Vancouver. Every member of EC staff is very friendly. They always help us! I have met many friends in EC. My English is improving because I try to talk to them in English. There are people from a lot of countries, from all over the world. They are super kind. I make friends as soon as I talk to them. They celebrated my birthday with me in a traditional way and I had a great time. I love learning and using everybody’s name because their names are from other countries and they can sometimes be difficult for me but practice makes perfect. We teach and correct each other which really helps us to improve. I try to make conversations with many friends and we go for lunch after the school. We also enjoy going to many touristic places in Vancouver. I am enjoying a super great school life in EC.